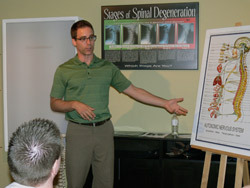 Dr. Neil will give a detailed overview of how structural chiropractic care works. If Dr. Neil determines you are a good candidate for structural chiropractic care, he will then arrange for your next visit, the Doctor’s Report. At the Doctor’s Report, Dr. Neil will give a detailed overview of how structural chiropractic care works as well as the evidence supporting the specialized work that we do. This takes place in a small group setting with other new patients. Following the report, you will be taken privately to review the results of your examination and your x-rays (if taken). Dr. Neil will then let you know how much we can help you and you can decide what you’d like to do. Dr. Neil adjusting his patient. When you begin care, a typical visit only takes a few minutes. An adjustment doesn’t require much time, but it is what allows your body to begin the healing process. Spinal problems rarely get better on their own. Call our Ancaster chiropractic office today to get started with chiropractic care!